Here it is Folks; at last the HALO Covenant Titanium Color ENERGY SWORD Type-1. Now you can own not only just the video game but part of the video game and the weapon to defeat the bad guys. This Titanium Color Energy Sword is a close quarters melee weapon use in Halo. 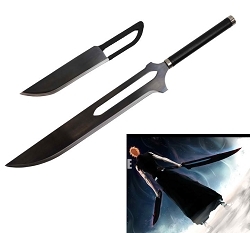 Folks, this sword is one of the most unique and awesome weapon which you will ever own. It is favored by Sangheili and it's more dangerous than its ceremonial nature implies. This life-size weapon carries an almost exact handle which is used to keep the sword in the video game, Halo. 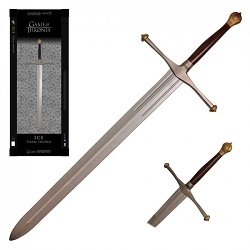 Folks, now instead of paying high price for something which is cheap, now you only get this life-size sword. Item also includes a wooden wall plaque. 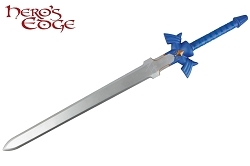 The Type-1 Energy Weapon/Sword, known more commonly as the Energy Sword, is a close quarters melee weapon. Favored by Sangheili, this energy weapon is more dangerous than its ceremonial nature implies. It is available to use in all Halo games except in Halo: Combat Evolved where it is only seen used by Stealth Elites and Zealots in campaign. The Energy Sword's Plasma is held into a blade-like form by a small magnetic-field generator built into the handle of the weapon. This same technology is utilized in all Covenant plasma weapons. In Halo: Combat Evolved, if the Elite wielding the sword drops it, a fail-safe activates, deactivating the magnetic field without first dispensing the plasma, consuming the handle and thus destroying the weapon. In Halo 2, a similar fail-safe is active when not wielding the weapon directly. The handle must be under pressure from the handler to be activated, so the weapon can be stored. Also this weapon, when used properly and skillfully, is one of the deadliest in the game. It looks great. It's fun to play with. Any halo fan would love it. It comes w/ it's own plaque.